One of the hardest parts of being in Beijing, and out in a more suburban part of Beijing is my inability to drive. If the weather was nicer, I might be able to ride a bike a few miles to the grocery store, but between the air quality issues and also the danger of riding a bicycle, with China drivers, that isn't a good solution. I have to rely on sharing a driver with my husband (with a 30-60 minute commute, both ways), who doesn't speak English, who often smells so bad it makes me want to puke, and the issues that come with limited time, limited ability to communicate and not wanting to have a 15 minutes conversation about a 5 minute drive to get a liter of milk, or the cinnamon I forgot for my recipe. Driving in China is a bit insane. According to Beijing municipal statistics bureau data there are 5.2 million cars in Beijing and I'm here to say that are not enough roads!! Traffic is a constant nightmare in the city. To be able to drive though even if you have the license and car there are quite a few obstacles you have to overcome to drive in Beijing. Gone are the days where if you own a car you can get a license plate. Here in Beijing, one in seventy-seven people are able to get a license plate, which is done through a lottery. Just because you own a car, or want to buy a car doesn't mean you will be lucky enough to score a plate. In January, 1.4 million people competed for 18,653 plates, according to the municipal transport commission provided by China Daily. Drivers in Beijing aren't the most cautious drivers to put it mildly. They drive between the lines, too fast, too slow, in the emergency lane, they cut you off, and they run red lights just to name a few. Reading the driver's test questions makes me laugh because I'm pretty sure China drivers don't obey even 15% of the rules on the test. 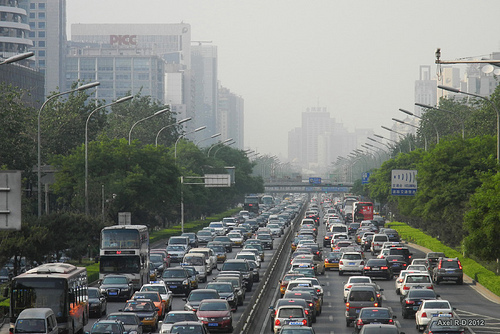 Imagine 6 lanes of cars in 3 traffic lanes, and that is Beijing. I'm not sure who in China actually translates the Chinese questions into English but let's just say a few leave a lot of be desired. Right now I'm studying with an app. Here are a couple questions and a few screen shots of questions, comment below with your guesses on the answers and I'll post the answers later! 4. An article that cannot be used to stop bleeding by dressing is ______. Can't wait to see everyone's answers, I promise to post the answers once people have commented. Make sure not to think too hard about them! I'm going to start a weekly blog post with pictures from the week. I try to take lots of pictures and I see some pretty crazy things. Enjoy! China's push at changing food behavior, and food waste with this ad in China Daily, the English newspaper in China. Trash Day? I've never seen a garbage truck here. Cool view from a bridge over one of the main roads close to downtown Beijing. A neighbor's front yard, putt putt anyone? Saw this treat for sale at the quick mart, doesn't that look like a beak? My Beijing neighbors are really smart sheep that travel by 4 lane highway and follow traffic lights. What's your favorite picture or most unbelievable from this week? I'd love to hear your comment below.